The recent deaths of Cronus and Apophis have left the System Lords fighting among themselves for power, and a mysterious and unknown adversary has been sowing discord among them and exacting heavy losses. Now seven key System Lords have arranged for a summit to discuss a truce and the establishment of a new order. Ren'al arrives at the SGC with a proposal from the Tok'ra. An undercover operative at the summit could eliminate all the key System Lords at once, and a human volunteer, well versed in the ways of the Goa'uld, is needed. Daniel Jackson accepts the mission. SG-1 and SG-17, including the new recruit Lieutenant Elliot, travel to the Tok'ra base on Revanna for an orientation. There they learn that Lantash, the symbiote within Martouf before his death, has been kept alive in stasis awaiting a new host. Shortly after their arrival, however, a fleet of motherships, under the command of Zipacna, arrives at Revanna and begins an aerial bombardment of the planet. There is no escape, and in the attack, all the Tok'ra of the base are killed. Lieutenant Elliot is gravely wounded, and Lantash takes him as a host in an attempt to heal him. 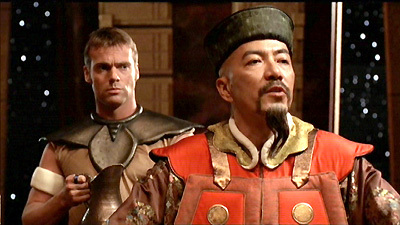 Meanwhile, Jacob travels with Daniel to the Goa'uld summit as he prepares to go undercover as Lord Yu's loyal slave. The System Lords have arrived, but there is word that a mysterious guest is also expected. Daniel prepares to carry out the Tok'ra plan to release a virulent poison, deadly only to symbiotes, which will eliminate the System Lords. However, he hesitates when the final guest arrives. It is Osiris, within the host body of Sarah, and Osiris recognizes him. As SG-1 is trapped in the tunnels below Revanna, Daniel is confronted by a triumphant Osiris. The deaths of Cronus and Apophis created a power vacuum among the System Lords, who fought among themselves for several months. Anubis has been attacking all the System Lords secretly and exacting heavy losses. As an unknown adversary, shrouding himself, he sows discord among the other System Lords. Zipacna is acting as an emissary for Anubis. The seven major System Lords arranged a summit to discuss a new order. Those expected included Baal, Bastet, Kali the Destroyer, Morrigan, Olokun, Svarog, and Yu Huang Shang-ti. Osiris arrived representing Anubis. Baal wiped out the inhabitants of two star systems, 60 million lives, rather than lose them to Sokar in a territorial dispute. Bastet and Kali the Destroyer made a treaty with Sobek, then moved against him during the celebratory feast when he let his guard down. Rumor has it his head still decorates Bastet’s palace in Bubastis. For unknown reasons, and for the first time in thousands of years, the Goa’uld are showing zero population growth. A dying symbiote releases its own deadly toxin which kills the host. Lo’taur is the highest rank among the human slaves of the System Lords, like a personal attendant, considered to be a position of great honor. SG-17 under the command of Major Mansfield, with Lieutenant Elliot, joined the joint mission with SG-1 for orientation from the Tok’ra on Revanna. Elliot was severely injured in the attack and the other members were killed.